Star Wars fans love to dress up as their favorite characters, but cosplay is not just about accurately recreating costumes. The best cosplayers bring a level of creativity and wit to their creations, in addition to stunning craftsmanship. These cosplayers take their craft seriously and their love of Star Wars to whole new levels. 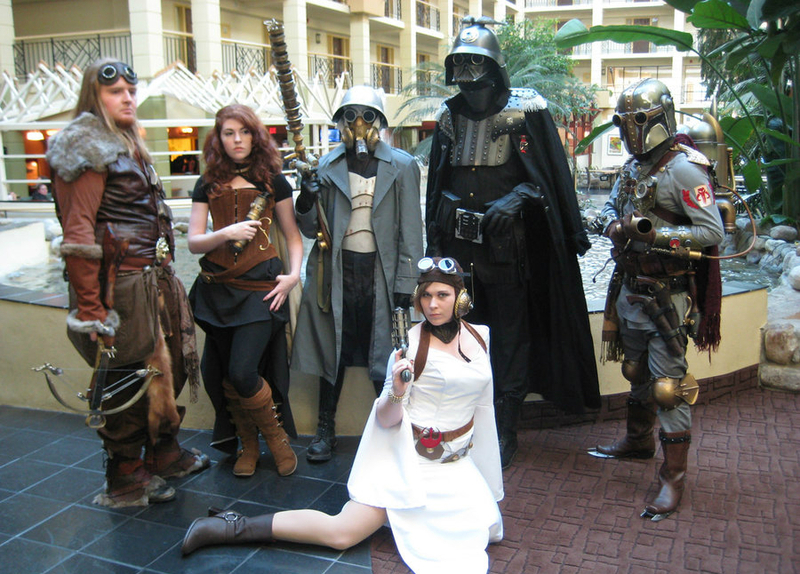 Here are 11 Star Wars cosplays that went above and beyond. Now that Star Wars is officially owned by the House of Mouse, there’s sure to be crossovers of all sorts. But it’s one thing to mash up X and Y, and another thing to blow us away. In this stunning photoshoot, photographer York In A Box brings the magic with all the different ways you can “imagineer” one single character: Boba Fett. 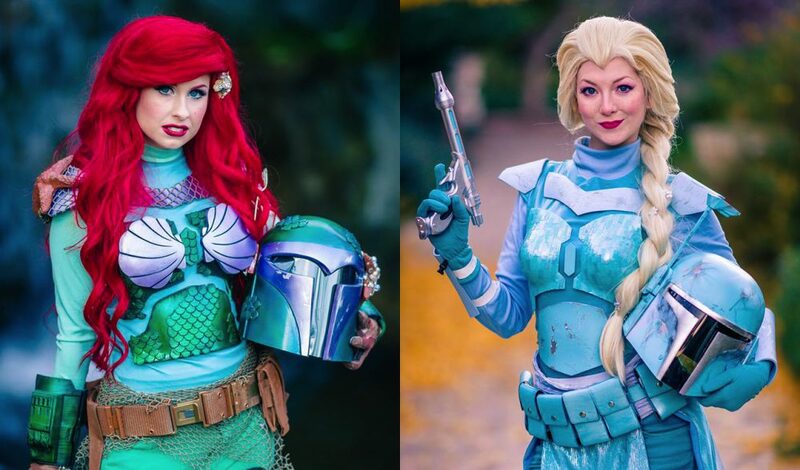 There’s Ariel Fett, Elsa Fett, Tinker Fett and more among almost a dozen Disney renditions of everyone’s favorite bounty hunter. See if you can identify them all! Everything goes better with gears, right? Retrofitting the Star Wars universe in a decidedly brass and clockwork theme seems the perfect fit, considering that Star Wars itself was inspired partly from Saturday morning serials like Commander Cody. Channel your inner Jules Verne and prepare for adventure! These brilliant designs come from Outland Armour, who has a whole gallery of steampunk Star Wars pics to view. This seems another obvious crossover, as another inspiration for Star Wars was the Akira Kurosawa movie Hidden Fortress. The Jedi definitely have a Samurai vibe to them, as does the design of the Stormtrooper and Vader helmets. 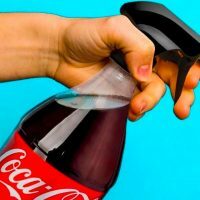 Why not take it all the way? The theme is so popular there’s actually a commercially available Samurai Darth Vader costume. 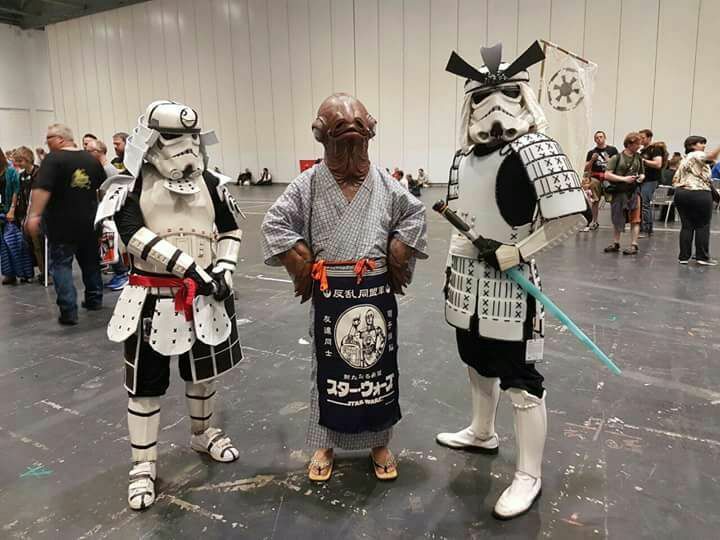 But nothing beats the level of detail in this Edo era Admiral Ackbar and Samurai Stormtroopers. Take one well worn cosplay suit of armor, a bottle of glue and a bazillion crystals, and you have the craft project of the ages! Brad Hartsock, member of the 501st Legion (Star Wars cosplayers who do a lot of charity work) decided his old suit had seen better days, so he ordered a new one. 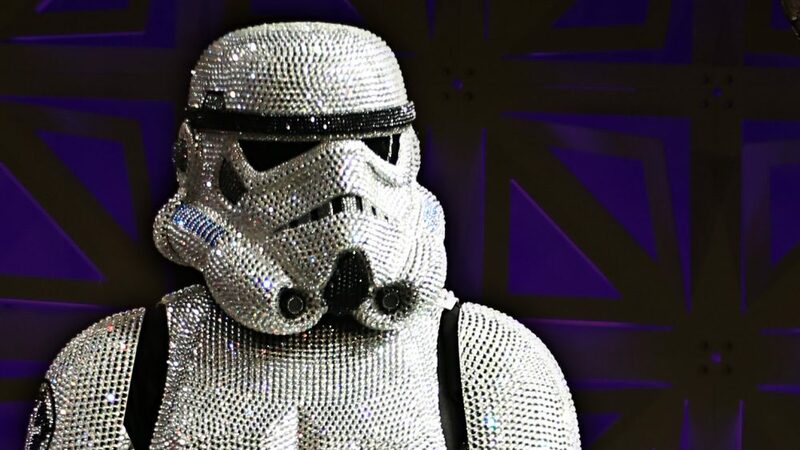 But his wife convinced him it was salvageable, and seven months of bling-work later, he debuted the armor on stage at Star Wars Celebration 2017 and won Most Elaborate and Best Overall. There was a time when Star Wars costume options for women were limited to a choice between “Regular Leia” and “Slave Leia.” But Star Wars fans are way more creative than that! 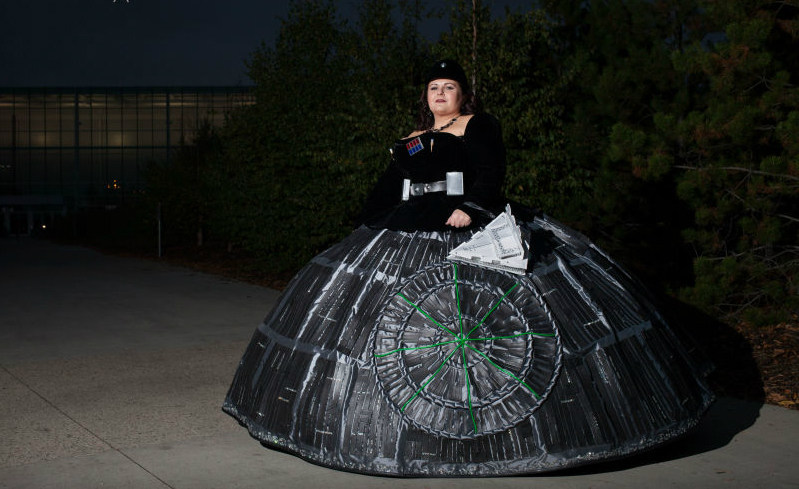 Historical re-enactors got involved and started making crinoline versions of Star Wars themed ball gowns. And what to wear but the biggest star of them all: the Death Star itself! Complete with matching Star Destroyer handbag, you don’t dare get caught in her tractor beam! Best of all, Lady Death Star wrote a blog post about how the gown was made (and how to make your own). Remote control R2-D2s are so 20th century. Making a walking, full-scale puppet costume of K-2SO, the snarky droid from Rogue One? 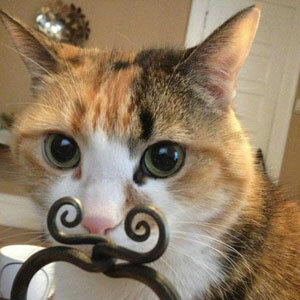 Now that’s cosplaying! 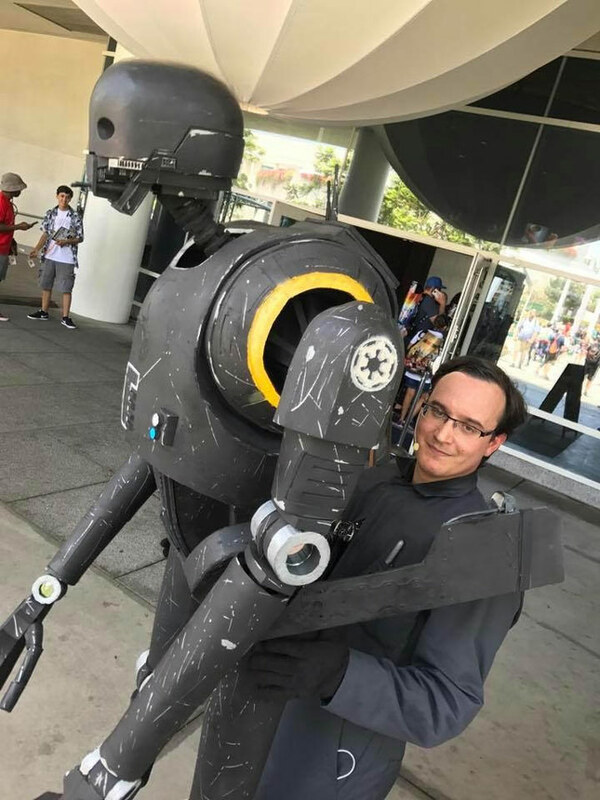 Darren Moser made his droid out of PVC pipe and black foam, and after much trial and error he was able to maneuver around a convention floor in it. The head was outfitted with a camera that connected to an iPad display and allowed him to “see” in front of him. You can see how Moser built K-2SO on YouTube, and find him on Instagram detailing his next cosplay build. This Han Solo baby cosplay makes us go “Awww” in less than 12 parsecs. 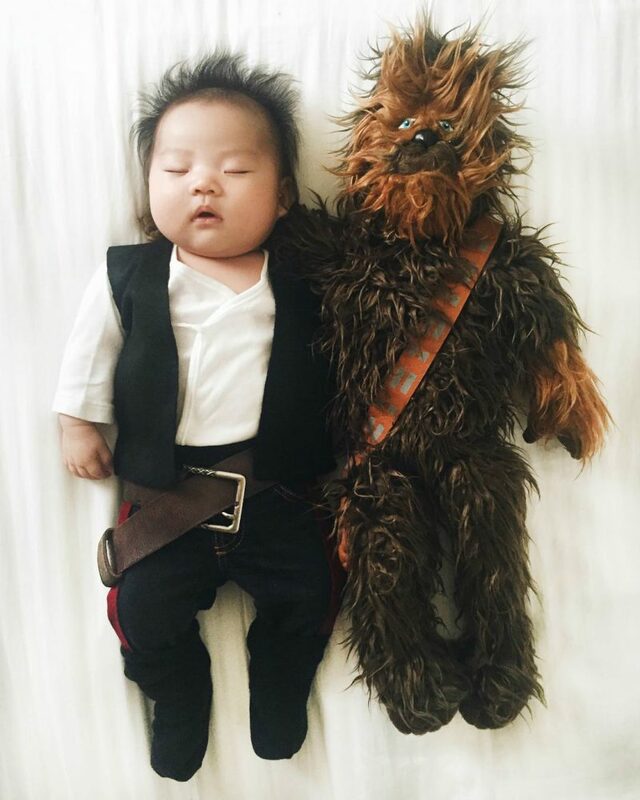 Laura Izumikawa’s Instagram blew up when she started dressing her infant daughter Joey in costumes while she was sleeping, but her Han Solo is a masterpiece. Remember, it’s not wise to upset a napping Wookiee! 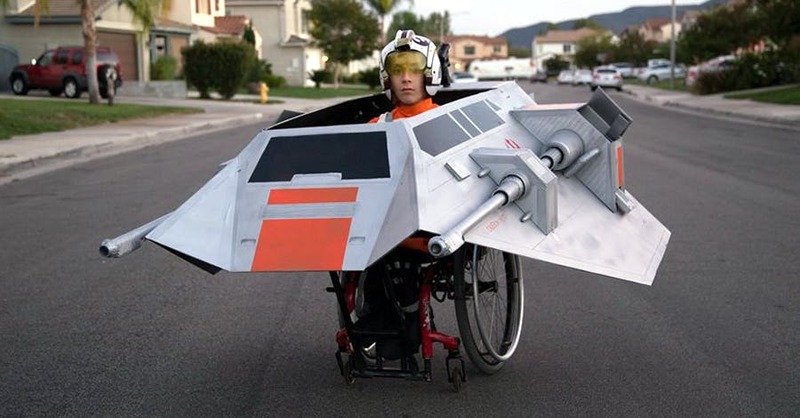 Star Wars is for anyone and everyone, which is why California dad Ryan Scott Miller built a fully tricked out Snowspeeder from The Empire Strikes Back to fit over his son Jeremy’s wheelchair, creating an epic Luke Skywalker cosplay. All we’re saying is when Jeremy puts on his Rebel helmet and orange flight suit, that lady in the Death Star gown better start running. Check out video of the Snowspeeder in action here. Forget the Force – you know what else binds the universe together? Legos! But seriously, the Lego Star Wars universe is almost as big as the original one, so why shouldn’t there be cosplays for it? 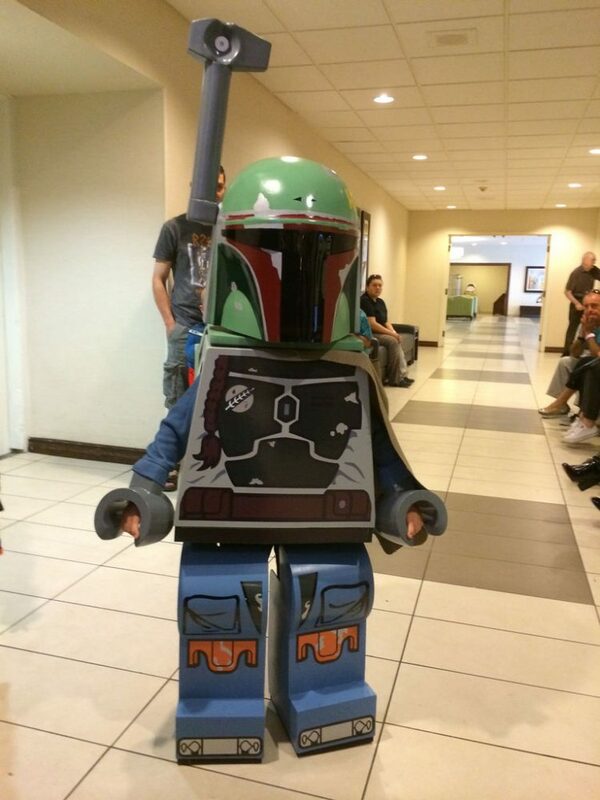 A Star Wars fan and dad built a perfect replica of Boba Fett’s Lego mini figure for his six-year-old son to wear. The level of detail is astonishing. And then he posted how he built it so anyone can make one! There’s an old fannish saying: the family that cosplays together, stays together. 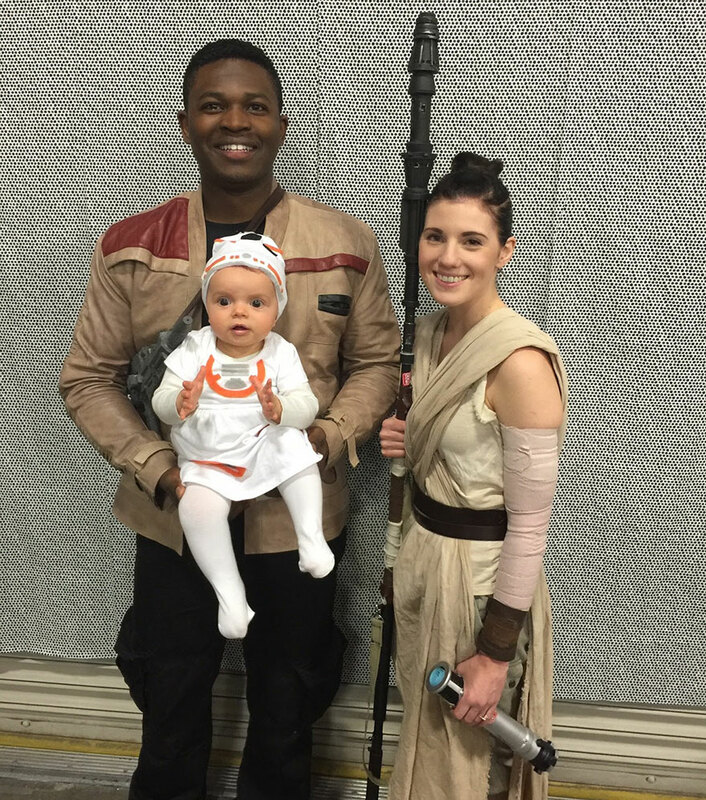 When Victor Sine and his fiancée Julianne Payne saw The Force Awakens they knew they would make excellent Finn and Rey cosplayers, but what to do with their new baby Addie? That’s how BB-8 became Baby-8. They took their costumes to the local sci-fi convention and were some of the most photographed cosplayers there. 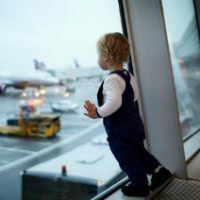 You can see more on Victor’s Facebook page. You didn’t think this list was going to get away with only human cosplayers, did you? 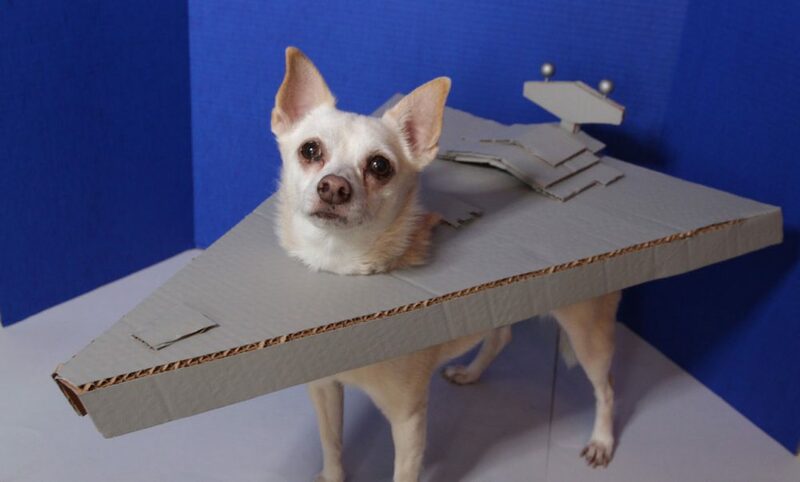 Anyone can be a Star Wars character, but try being an entire Imperial Star Destroyer sometime. This adorable outfit and others are creations of Jennifer Landa. Check out more at her Instagram account.